The Presence of Water in Contemporary Art. A Material Semantic Approach. The Polish-born artist Monika Weiss (Warsaw, 1964 -) has developed a particular ritual of immersion in amniotic and baptismal waters in her Ennoia (2002). Naked and in fetal position, immersed inside an octagonal font filled with cold water, Weiss presented a state of pre-consciousness, in which mingled sounds and images of distant times, referred to - beyond any religion - relations between history, memory and presence. There was a dialogue between the actual imperceptible movements of the body of the artist during the six hours of performance inside this vessel; the live transmission of the underwater soundscape by Stephen Vitiello; and the projection on the wall of a video that represented the prerecorded (earlier) immersion. A space was created about and through the water, with its thinned and sensory temporal limits. In the absence of the actual immersion, the missing body of the artist inside the vessel was supplanted during her other exhibitions by a video projected directly into the water, which juxtaposed ephemeral images of the artist's body with the water’s own element. *See the full text in Appendix 3. Documents written by artists: WEISS, Monika. "Artist's statement about water". [Correspondence with Monika Weiss, 12/2009]. Executed first for the Diapason Gallery in New York, Ennoia has been repeatedly shown as a series of works, both as performances and installationsas well as drawings, since 2002, at the Chelsea Art Museum, New York -Ennoia: Performing Water, 2003 and White Chalice (Ennoia) 2004 -, in the Remy Toledo Gallery, New York - White Chalice (Ennoia) 2004 -, in the Lehman College Art Gallery, CUNY - White Chalice (Ennoia) 2004 -, at Galerie Samuel Lallouz, Montreal - Ennoia-Drawing Series, 2001-2005 -; Montanelli Museum, Prague - White Chalice (Ennoia) 2004 -, and the Centre for Contemporary Art Galeria El, Elblag - Chalice (Ennoia 2), 2009. This thesis studies a specific relationship between matter and form, which can no longer be related to stability, solidity and objectuality, as it has been traditionally interpreted. 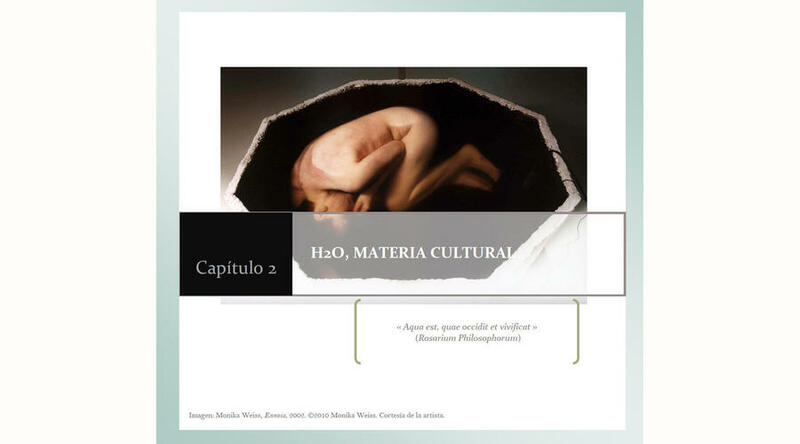 To this aim, it firstly explores the plurivocity in the concepts of 'matter' and 'artistic material'; and secondly it examines a case study about water as a material presence in contemporary art. As the study develops, certain issues arise, such as the problematic use in the specific context of the artwork of notions like form, information and memory. The methodological lines of this thesis are an alternative approach to the artwork’s technical and material system, this understood as a synergistic and complex structure of symbolic, technological and imaginative relations. 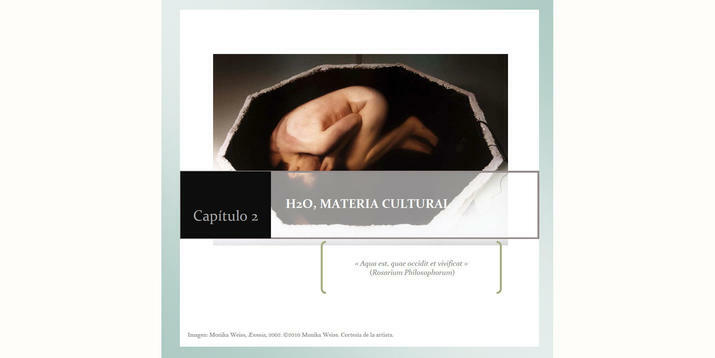 This methodology focuses on the evolution of the 20th century´s technical and technological thinking, establishing the connection between past and current uses of media and materials. Based on the principle of transversality, this study contributes to the expansion of the Third Culture by visualizing the dialogical relationship between art, science, technology and aesthetics.